Rafa was in formidable form on Centre Court earlier. 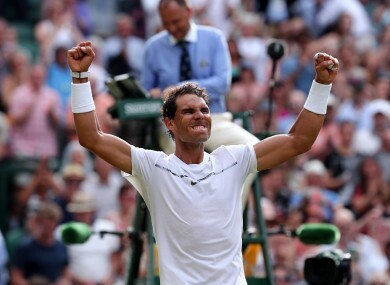 RAFAEL NADAL SLUGGED his way into the Wimbledon last 16 with a bruising dismissal of Karen Khachanov, while Kei Nishikori admitted he can’t cut it on grass after the Japanese star crashed out on Friday. Having won his 10th French Open crown without dropping a set last month, Nadal has made the switch from clay to grass with such ease that his title rivals might be getting a little worried. His 6-1, 6-4, 7-6 (7/3) win against Russian 30th seed Khachanov equalled the Spaniard’s personal record of 28 successive sets won at Grand Slams, a blistering streak dating back to this year’s Australian Open final. Nadal’s second and most recent Wimbledon title came in 2010 and the 15-time major winner hasn’t been past the fourth round for six years. But world number two Nadal is in formidable form heading into only his second fourth round tie in his last five visits to Wimbledon. His opponent is 16th seed Gilles Muller, who defeated Aljaz Bedene 7-6 (7/4), 7-5, 6-4 to reach the last 16 for the first time at the age of 34. “I played fantastic for a set and a half but it got tougher after that. He started to hit stronger so I was happy to get through in three sets,” Nadal said. Former US Open finalist Nishikori had hoped to finally advance past the fourth round at Wimbledon after years of underachievement. But the world number nine didn’t even reach the last 16 as he was over-powered 6-4, 7-6 (7/3), 3-6, 6-3 by Spanish 18th seed Roberto Bautista Agut. Nishikori’s third round exit means Wimbledon remains the only Grand Slam he has failed to make the quarter-finals. It was the 27-year-old’s earliest departure from a major since his first round defeat against Benoit Paire at the 2015 US Open. “It’s not easy. I don’t have good results on grass. I have got to work on it every year,” Nishikori said. Former US Open champion Marin Cilic advanced to face Bautista Agut with a 6-4, 7-6 (7/3), 6-4 win against American 26th seed Steve Johnson. With former England captain David Beckham watching from the Royal Box, former world number one Victoria Azarenka defeated British wild card Heather Watson 3-6, 6-1, 6-4. Competing in her first Grand Slam since taking a year off to have her first child — son Leo — in December, Azarenka was caught out as Watson made a fast start to her attempt to reach the last 16 for the first time. But the two-time Australian Open champion stepped on the gas to keep alive her attempt to emulate Evonne Goolagong, who was the last Wimbledon mum to lift the Venus Rosewater Dish in 1980. Only Goolagong, Margaret Court and Kim Clijsters have won a Grand Slam singles title after having a child. “The whole match I was a little bit on the back foot. The second set I started to step in a little bit more,” Azarenka said. Next up for Azarenka, who reached the Wimbledon semi-finals in 2011 and 2012, is world number two Simona Halep. Halep, beaten in the French Open final last month, eased through with a 6-4, 7-6 (9/7) win against China’s Peng Shuai. British sixth seed Johanna Konta showed why she is the new bookmakers’ favourite for the title with a 6-4, 6-1 rout of Greek world number 101 Maria Sakkari. With two-time champion Petra Kvitova and third seed Karolina Pliskova eliminated, Konta hopes to become the first British woman to win Wimbledon since Virginia Wade in 1977. Women’s world number nine Dominika Cibulkova slumped to a 7-6 (7/3), 3-6, 6-4 defeat against Croatian 27th seed Ana Konjuh. French Open champion Jelena Ostapenko made the last 16 for the first time with a 7-5, 7-5 win against Camila Giorgi. Ostapenko faces Elina Svitolina, the Ukrainian fourth seed who defeated Carina Witthoeft 6-1, 7-5. Later on Friday, defending champion Andy Murray sets his sights on a 10th successive last 16 appearance when he faces flamboyant Italian Fabio Fognini. Murray hasn’t lost before the fourth round of any Grand Slam for seven years, but he was beaten in three of his six previous meetings with Fognini, including a straight sets defeat in Rome this year. Email “Rafa Nadal has now won 10 consecutive Grand Slam matches without dropping a set”. Feedback on “Rafa Nadal has now won 10 consecutive Grand Slam matches without dropping a set”.